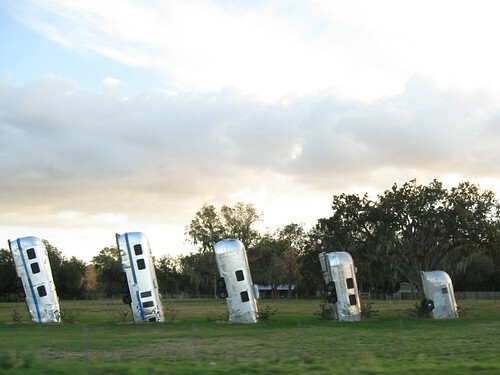 "Airstream Ranch" supposedly an artwork on Interstate 4, near Dover, Florida, consists of Eight Airstream Campers buried head down with slight tilt. Since its creation, it is mired in legal battle between the owner and the city authorities. 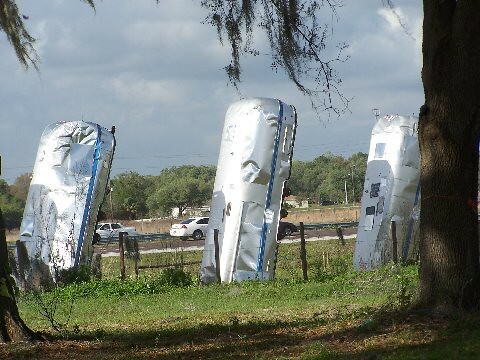 Frank Bates, a dealer in recreational vehicles, in 2007 buried Eight Airstream campers in a field, to commemorate 75th anniversary of Airstream Campers and called it "Airstream Ranch". He was inspired by Cadillac Park (wikipedia), Amarillo, Texas. Bates claimed that his work was a piece of art, while the city officials felt that burying junk vehicles in this manner was illegal and violated the city code for proper disposal of old vehicles. 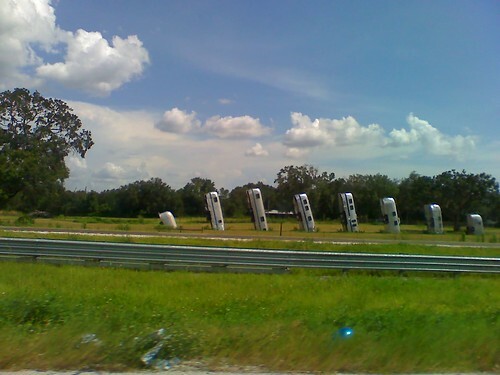 As the semi-buried campers are visible from the nearby Interstate 4 they also felt that the so called art work amounted to surrogate advertising of Bates' business located nearby. Bates was served a notice and a fine of USD 100.00 per day till he removed the buried vehicles, which he refused to pay. The matter finally went to the court and in 2010 Bates got a reprieve from the court who decided that his act was legal. The court however didn't decide whether it is a piece of Art or Junk. It is understood that the city officials are going to appeal against the decision so the fate of this so called art work still hangs in balance. The Airstream Ranch has however gained popularity and many visitors support his work while some of his neighbours feel that it is a nuisance.